About three weeks ago, I noticed that The Beatles have released several new video recordings on their TheBeatlesVevo channel on YouTube, check it out. I'm currently working on a new blog that needs a bit more research so thought I would post a little topical song for the folks in Southern California desperate for some rain and in the forecast. I know with the "bomb cyclone" in the east that people there would welcome "just rain" so here's thinking to some warmer weather ahead for them. 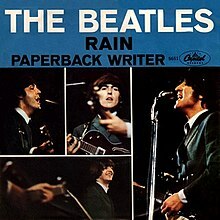 With that in mind, I remembered The Beatles' Rain just being released on YouTube as I noted above. So here's to some rain, at least in So Cal, but not too much because of the fires and then mudslides. Happy Monday.